Although National Smile Month has come to a close we thought we would just share one last xylitol recipe, because you can never have enough guilt-free sweet treats. As part of our Smile campaign we challenged one of our Instagram buddies Emily to come up with her own low sugar recipe. There was only one rule – that she had to use our favourite healthy ingredient xylitol. Here’s what she came up with. If you’re a workout guru, these ones are definitely for you. Place the xylitol, lucuma, mesquite, vanilla protein, almond four and cocoa into a bowl and combine thoroughly to ensure there are no clumps. Make your own nut butter by placing the nuts, raisins/dates, and water in a food processor. Combine the ingredients together until the mixture reaches a smooth nut butter consistency. Who knew that could be so easy. Add the nut butter mixture to the dry vanilla mix and combine until it forms a doughy consistency. 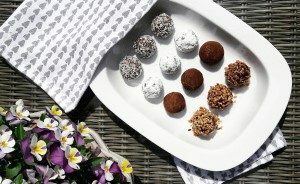 Split the mix into 6 and roll into individual little balls before tossing in the desiccated coconut and the vanilla powder (or any other toppings you fancy for that matter). If you can resist eating them straight away then they are best to nibble on before or after a workout. Yum. The post Vanilla and almond energy balls with xylitol appeared first on Peppersmith.